The catastrophe bond market dropped on Friday as hurricane Harvey approached the Texas coastline, reflecting a little nervousness among investors regarding a few outstanding cat bonds that were deemed the most exposed to the storm, based on the forecasts at the time. The Swiss Re Cat Bond Price Return index dropped 0.44% during last week, which Bloomberg cited as the steepest drop since January this year. A number of outstanding catastrophe bonds have traded at slightly below par prices, with the most action focused on some of the Texas Windstorm Insurance Association (TWIA) sponsored Alamo Re cat bonds it appears. The $400m from Alamo Re Ltd. (Series 2017-1) has seen the steepest price drop on some broker pricing sheets, with prices marking the bonds down for bids just below 90 on Friday. The two tranches of the $700m Alamo Re Ltd. (Series 2015-1) cat bond are also marked down, although not as far with bids around 95 invited. According to FINRA data, the Class B tranche of the Alamo Re 2015-1 cat bond traded on Thursday at 95. Clearly a case of an investor offloading their stake in these bonds in case of a loss. We’re also told another Alamo Re trade was made at 97.25 on Friday, although it’s unclear which tranche of the deals this was. Meanwhile, the Class 10 tranche of the Residential Reinsurance 2017 Ltd. (Series 2017-1) cat bond have been seen to be marked down for bids below 90 on some broker pricing sheets as well, while the Class 2 tranche of the Residential Reinsurance 2016 Ltd. (Series 2016-2) cat bond has been seen marked down to bids of 95. A few other cat bonds with Texas hurricane exposure are also marked down a few notches since hurricane Harvey, but nothing that will likely cause concern and they should all recover value in the coming days, as could most of the above as the extent of insurance and reinsurance industry losses from Harvey are assessed. That could cause mark to market losses from some cat bond funds and investors, but these would be expected to recover. More interestingly though, the recent World Bank supported IBRD / FONDEN 2017 catastrophe bond, the latest World Bank Capital-At-Risk notes transaction, which has a parametric box that extend upwards along the Texas coastline in order to account for a hurricane that came ashore through Texas to impact Mexico, has perhaps experienced a close shave. 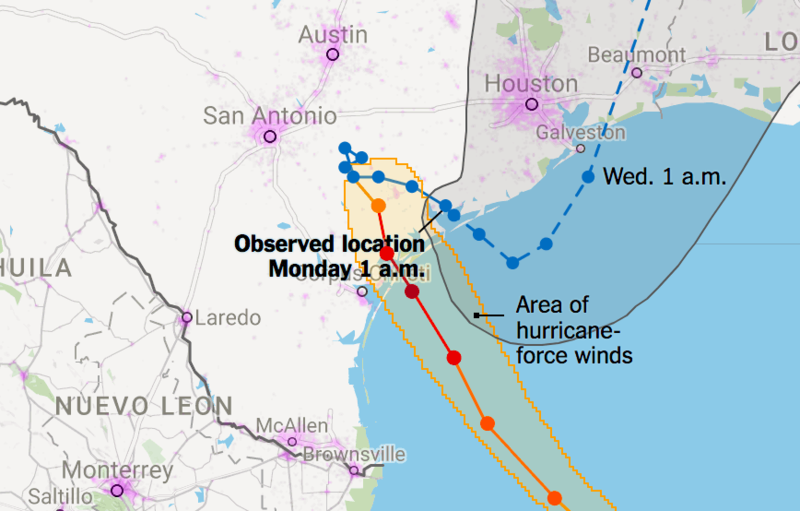 The map below (from the New York Times coverage) shows the location that hurricane Harvey made landfall. 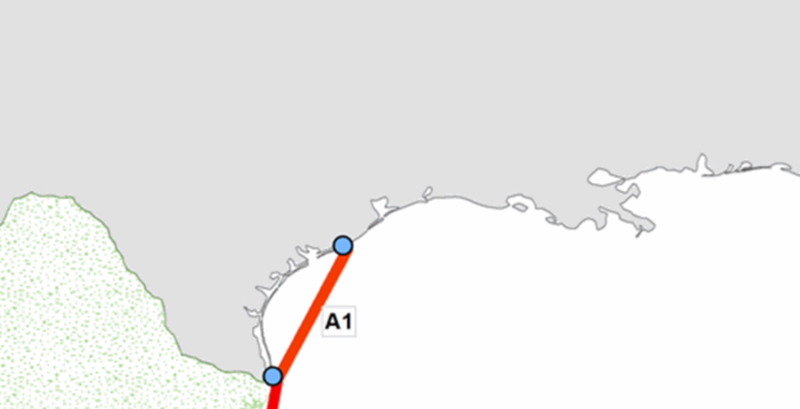 The graphic below is taken from the Fonden 2017 catastrophe bond documentation and shows the location of the parametric box which extends along the Mexico coastline. The location of hurricane Harvey’s landfall appears to be within the A1 parametric box of the Fonden 2017 cat bond trigger. In order for the transaction to payout the minimum central pressure at the time the eye crosses the A1 box would need to be between 935mb and 932mb to trigger a 25% payout of principal. The NHC reported Harvey’s central pressure was 938mb at landfall, which is a little later than where it would have crossed into the box and the central pressure had been dropping at the time. That would imply that at the time Harvey passed into the parametric trigger area, if indeed it did this does need confirming by modelling companies with the actual box location data, then the central pressure was likely higher than 938mb at the time. The update immediately prior to landfall gave a central pressure of 941mb. However, the final determination may have to wait for the final tropical cyclone report to be released by the NHC, which can take some months as investors in the MultiCat Mexico 2012 catastrophe bond found after hurricane Patricia. In that case it looked like the determination of triggering or not was too close to call and so the final report was required to make the decision. When that report came in, it took into account data captured on land by a storm chaser and this resulted in the pressure at crossing the box dropping and caused a payout. So right now it looks like the new Fonden cat bond has had a close shave but should be safe, based on the NHC reported data. However there could be some uncertainty if the final report is deemed necessary to determine whether the bond could face a loss and that could leave investors waiting some time to know the outcome. At this time we don’t have any data on the Fonden Class B notes trading and they remain priced at 100 on the Luxembourg Stock Exchange. At this stage it looks like this assessment could be correct, particularly as the major cause of economic loss from Harvey looks set to be flooding. The Fonden bond could be a spanner in the works, but it is to be hoped that investors will be given confidence and the reported data from the NHC will be deemed enough to put the Class B notes in the clear. That would seem a better result for investor confidence than dragging this out till the NHC releases its tropical cyclone report.